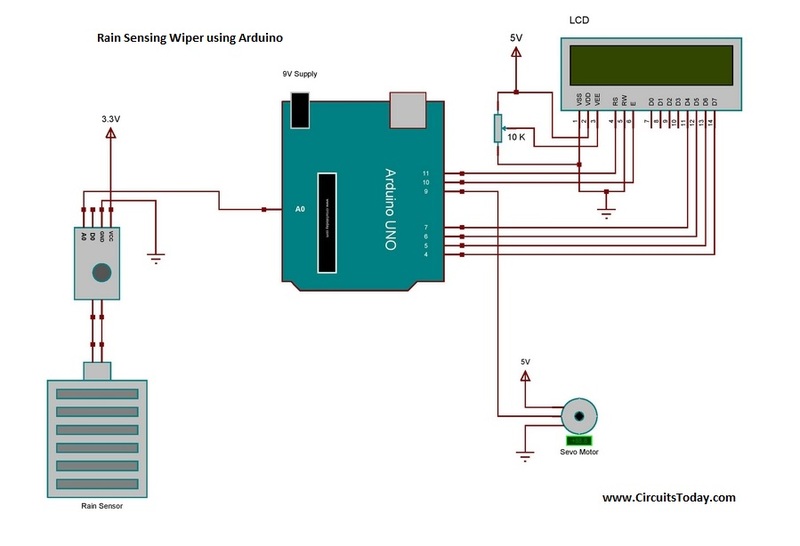 Â This project is designed to build a car wiper that automatically detects the rainfall intensity and regulates the frequency of wiper operation. It is built, using Arduino UNO board. A rain sensing module is used for measuring the intensity of rainfall. And a servo motor is used for controlling the wiper movements. An LCD module is also attached to the controller for displaying the rainfall intensity. By measuring the amount of rainfall , controller will adjust the speed of servo motor . Servo is controlled by generating PWM signal at its signal line. Measuring the amount of rainfall. 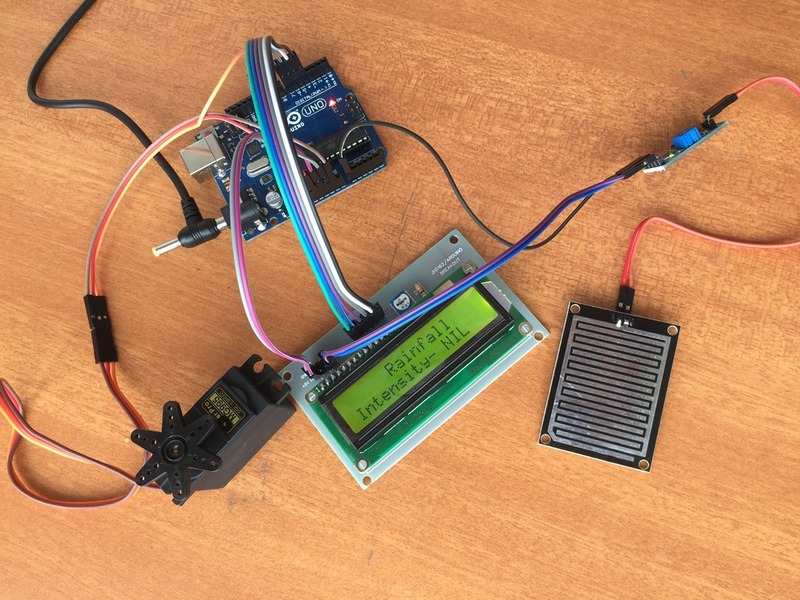 Displaying the intensity of rainfall in an LCD module. Controlling the servo motor speed according to the output from the sensor module. MH-RD rain detector is the sensor module that we are using here. The moduleÂ have 4 pins: Vcc, A0, D0 and Gnd. Vcc and Gnd are connected to the supply pins of the Arduino. Â A0 and D0 are the analog and digital output pins of the module respectively. Since we need continuous change in rainfall, we will make use of the A0 pin instead of D0. The analog out from senor is then connected to one analog input pin of Arduino. As mentioned earlier a servo motor is used here for wiper movements. Servo motor is a special kind of high torque dc motor whose shaft can be adjusted to desirable position by generating an appropriate PWM signal at its signal line. Here we connect the signal line of servo to one of the PWM pin of Arduino(i.e. digital pin 9). Next comes is the LCD module, which is for displaying the rainfall intensity. Interfacing of Arduino to 16Ã—2 LCD is quite simple. JHD162A is the LCD module used here. JHD162A is a 16Ã—2 LCD module based on the HD44780 driver from Hitachi. The JHD162A has 16 pins and can be operated in 4-bit mode (using only 4 data lines) or 8-bit mode (using all 8 data lines). Here we are using the LCD module in 4-bit mode. To facilitate communication between Arduino and LCD module, we make use of a built in library in Arduino <LiquidCrystal.h> â€“ which is written for LCD modules making use of the Hitachi HD44780 chipset (or a compatible chipset). Control pin RS, RW and En are directly connected to arduino pin 13, GND and 10. And data pin D4-D7 is connected to 7,6,5 and 4 of Arduino. When the device is switched ON, the servo motor will turn the wiper to Â zero degree position.Â After that the controller will continuously checks the signal from rain sensing module. If the signal from the module goes beyond a minimum value, the servo motor begins to operate .Â The speed of operation of servo will be varied according to the strength of the signal. And the intensity of rainfall will be displayed on the LCD according to the signal strength . Â At the beginning ,program will continuously check the reading from the rain sensor. A library called â€œServo.hâ€ is used here for servo operations. By calling the inbuilt function â€œmyservo.write(angle)â€ we can turn the servo shaft to desired angle. One more library called â€œLiguidCrystal.hâ€ is usedÂ , to facilitate communication between Arduino and LCD module. At the interfacing section the LiquidCrystal library is first initialized and then pins are defined using the command â€œLiquidCrystal lcd(RS, E, D4, D5, D6, D7)â€. The position of the servo will be at 0 degree at the beginning. The Arduino reads the sensor output through the analog input pins using the built in â€œanalogRead(pin_number)â€ function. For example â€œanalogRead(sensorPin);â€ converts the voltage (in the range 0 to 5V) at theÂ A0 pin into an integer in the range 0 to 1023. In this way the voltage at A0 is compared to a fixed number for identifying the current rainfall intensity . If the value obtained from the sensor goes beyond a specific limit, the controller will trigger the servo to operate. And the speed of operation will be varied according to the sensor output. A user defined function called â€œwipe(speed)â€ is used for controlling the servo speed. Meanwhile the intensity of rainfall will be displayed on the LCD module using the function â€œlcd.print(â€œlow/medium/highâ€).